Famous people born FEBRUARY 22 are not as simple as the other Pisces. They typically are busy individuals who come to the aid of others. They are sympathetic to the needs of others and could very well be voted Humanitarian of the Year. There’s no better friend than a famous person born on February 22. They are absolutely a clear air kind of person. They love the country and find peace of mind in an open field of green grass. As a downfall, famous people born on February 22 tend to not remember a lot of things… sometimes important things. This could be problematic as people then become upset with them and well, their feelings are easily hurt. They should learn to laugh at themselves more and to find ways to remember things. If you share this famous birthday, you don’t have many health issues. But you should rid your body of the bad stuff that lays dormant in your intestines every once in a while. You will feel much better. 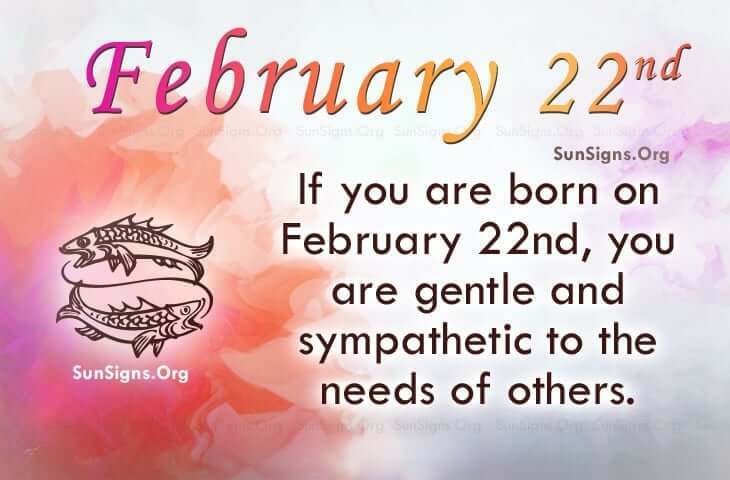 Famous people born on FEBRUARY 22nd are complicated but sympathetic Pisceans. They are likely the go-to person that makes sacrifices for loved ones. They are not afraid to show affection and find it gratifying to help other people. They tend not to be judgmental but suffer in silence with their troubles. Get a list of famous birthdays for February 22 below.